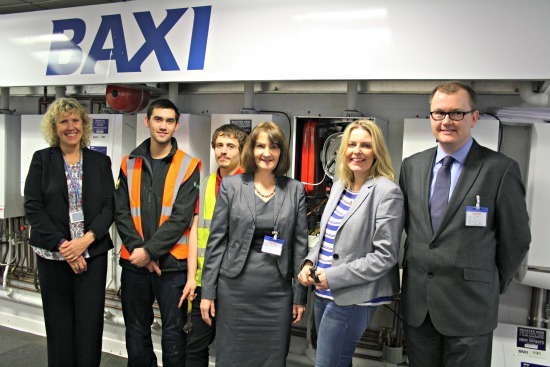 Eastleigh’s MP, Mims Davies, has helped to highlight the increasing need for more skilled workers in today’s construction industry with a visit to a specialist training centre within Eastleigh College. The Gas Assessment Centre at the college – also a satellite training centre for leading boiler manufacturer Baxi – offers significant training for students of all levels looking to become fully qualified gas safe registered engineers, who play a key part in the construction of housing. The Government just two weeks ago announced plans to directly commission thousands of new affordable homes on public property. However with recent reports suggesting a skills shortage across the construction and housebuilding sector, doubts have been raised as to whether these plans can be met. Courses available within the Gas Assessment Centre include the introductory ‘how to become a gas engineer’ course, through to more specialist courses for already established engineers looking to upskill in areas such as unvented hot water systems.